LANCASTER – The Antelope Valley Transit Authority on Thursday celebrated a new bus stop on their Local Route 3. 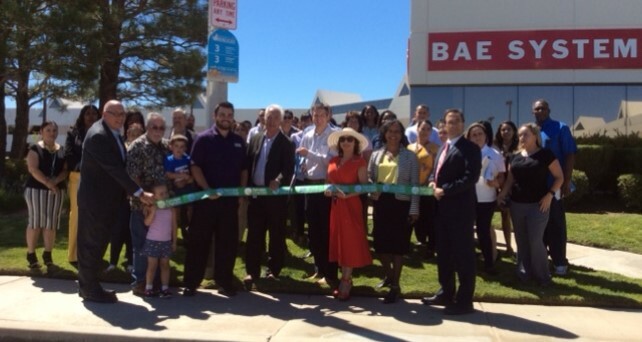 This stop, on Avenue 0-8 at Sierra Highway in Palmdale, will provide access to a business and employment center serving Los Angeles County Department of Child and Family Services, foster family care, a major aerospace company and a higher educational center. The new stop was included in recent service changes that were approved by AVTA’s board of directors in late July. “As the Antelope Valley continues to grow and thrive, we are committed to providing new opportunities for riders to efficiently and conveniently connect with jobs, schools and a broad range of community resources,” stated AVTA Board Chairman Marvin Crist. Support for the new bus stop was demonstrated by The Abbey Company, the owner and manager of the two commercial office/flex buildings located directly next to the new stop, which are currently 92 percent occupied but have six office suites available for lease. In an effort to raise awareness for and increase use of the new stop, they have purchased and distributed bus passes to their tenants that can be given to potential riders free of charge. “In recognizing this new stop brings benefits not only for our current and future tenants and the people they serve, but the entire community, we want to help ensure a successful kick-off by encouraging more people to use it,” stated Joshua Hunsberger, Director of Leasing for the Abbey Company. Since announcing their most recent service changes, AVTA has held multiple community outreach events to keep the public informed on new services and enhancements as well as developed new strategies to promote the benefits of utilizing mass transit. Riders are encouraged to visit www.avta.com for trip planning and to stay up-to-date on service changes.